The promise and mystery of Chinese medicine has intrigued and fascinated Westerners ever since the "Bamboo Curtain" was lifted in the early 1970s. Now, in Between Heaven and Earth, two of the foremost American educators and healers in the Chinese medical profession demystify this centuries-old approach to health. Harriet Beinfeld and Efrem Korngold, pioneers in the practice of acupuncture and herbal medicine in the United States for over eighteen years, explain the philosophy behind Chinese medicine, how it works and what it can do. 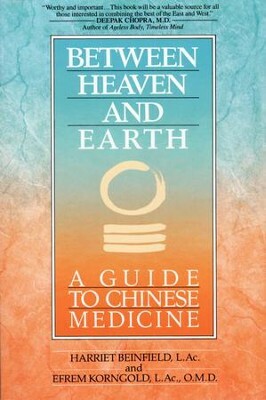 Combining Eastern traditions with Western sensibilities in a unique blend that is relevant today, Between Heaven and Earth addresses three vital areas of Chinese medicinetheory, therapy, and typesto present a comprehensive, yet understandable guide to this ancient system. Whether you are a patient with an aggravating complaint or a curious intellectual seeker, Between Heaven and Earth opens the door to a vast storehouse of knowledge that bridges the gap between mind and body, theory and practice, professional and self-care, East and West. Harriet Beinfield and her husband, Efrem Korngold, were among the first Americans to be trained at the College of Traditional Acupuncture in England and to be licensed in California. The couple maintains a private practice at their San Francisco clinic, Chinese Medicine Works. Efrem Korngold and his wife, Harriet Beinfield, were among the first Americans to be trained at the College of Traditional Acupuncture in England and to be licensed in California. The couple maintains a private practice at their San Francisco clinic, Chinese Medicine Works. I'm the author/artist and I want to review Between Heaven and Earth - eBook.